Part Used : Chamomile Flowers, Chamomile Stalks, Whole Plant. Habitat : Grows as a weed all over dry parts of india. Uses : Dried flowers of Matricaria chamomilla are largely used to provide sedative as well as spasmolytic effects. Tea made from chamomile is an excellent herbal tea that many use if they have trouble sleeping. Chamomile tea is also known to soothe digestion and relax the gastro-intestinal tract. This tea also helps to relax and soothe an anxious mood and is a good stress-relieving tea to drink prior to bedtime. It is rich in essential oil and can help the digestive system function properly. Chamomile is also very good for your skin and you can wet a cloth in the tea and use it as a skin cleanser or compress. Chamomile also contains several flavonoids, plant chemicals, that have anti-tumor and anti-inflammatory properties. 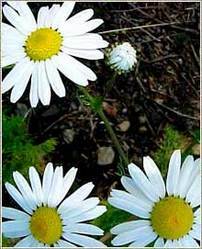 If you suffer from ragweed allergies, it is best to avoid chamomile tea. It is used in cosmetics, perfumery and as a flavoring agent. It is good for Skin care (most skin-types), acne, allergies, boils burns, eczema, inflamed skin conditions, earache, wounds, menstrual pain, premenstrual syndrome, headache, insomnia, nervous tension and other stress related disorders, digestive. It has a very low toxicity, therefore it is useful for children. It is used commercially in shampoos for fair hair and it can lighten hair color. It is splendid for kidneys, spleen, colds, bronchitis, bladder troubles, to expel worms, for dropsy and jaundice. It makes an excellent wash for sore and weak eyes.